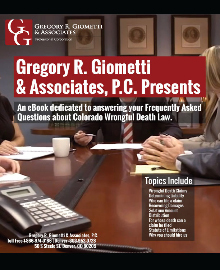 Wrongful Death Actions and Probate Litigation - Giometti & Mereness, P.C. When both the victim and the alleged responsible party die in an accident or because of another cause, the parties involved may have to deal with both a wrongful death claim and probate litigation. This is where our knowledge is a distinct advantage for our clients. We have experience in handling both wrongful death and probate matters. For comprehensive legal representation and reasonable fees, call or e-mail one of our experienced lawyers. Wrongful death and probate disputes pose unique challenges. Wrongful death statutes govern who may file an action on behalf of a deceased family member. The Probate Code contains non-claim provisions that require timely presentation of a claim against the personal representative of the deceased at-fault party. Our attorneys can explain the interrelationship between the wrongful death statutes and the Probate Code so that our clients can protect their interests when such complications arise. We are also experienced in handling claims under a provision of the Probate Code known as the “slayer statute.” Where a person dies as a result of a “felonious killing,” the party at fault may be barred from recovering from the decedent under a will, trust, or deed, or under a life insurance policy. Our firm has the experience both to pursue and defend against such claims, including the handling of complex issues that arise when disputed insurance proceeds are involved. While we are capable of handling wrongful death claims and probate litigation, our firm can also serve as co-counsel with other firms that need assistance in coping with these types of claims. Hire an experienced attorney who understands how to handle these types of claims. To learn more, e-mail or call us to schedule an appointment.